Updating my kids’ chore lists was one of the things on my summer bucket list, and when I shared on my Facebook page that I’d gotten it done, several of you asked to see the end product. I aim to please, so here I am. I kept it super simple by just making up a list on Microsoft Word (I told you I love that program!) and printing it out. I don’t own a laminator because I prefer not to coat something compostable or recyclable in plastic. If this one gets ripped, I can always just print out a new one and compost or recycle this one and to me, that beats any wipeability advantages that lamination offers. Also? Not laminating things means I don’t have to buy a laminator, so, yay! For the non-meal duty reminders, I also made them using Microsoft Word, but I got a little fancier, just for fun. I printed them out on slightly heavy paper, inked the edges, and then used sticky squares to adhere them to some scrapbook paper I dug up from my stash. 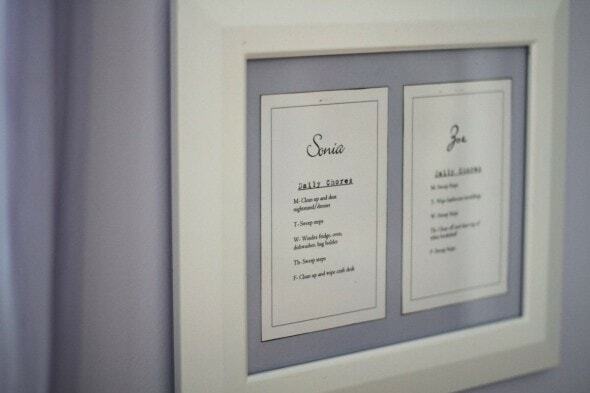 For Sonia and Zoe’s daily chore lists, I did something similar, except with an 8×10 frame. I’m pretty pleased with how well the paper coordinates with their wall color. It’s the small things, people. 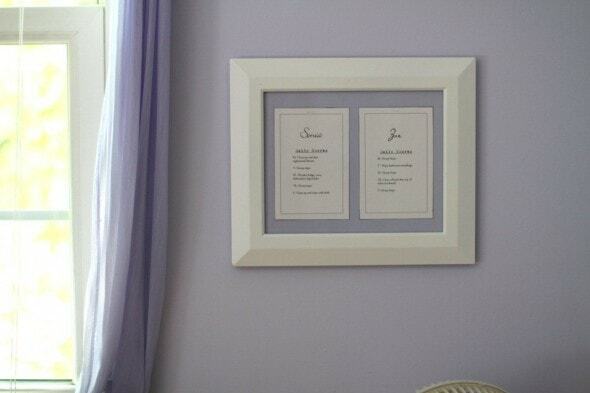 I also made a similar list for Lisey, and hers is in a black frame with gray scrapbook paper. I’m not quite sure why the paper looks wrinkly in the photo-it must be a shadow or something. It really is flat in real life. So, there you go. Chore lists that cost almost nothing. Edit: Joshua has chores too, but he wanted to design his own list, complete with hand-drawn characters (he draws super-cute little guys and animals). He’s not done with it yet, so that’s why it’s not pictured. He does indeed do chores just like the girls do. 2. Put away your schoolbooks, pencil, and ruler. 5. Do your daily chore. 3. Put any dirty clothes in the hamper. 5. Pick up things on the floor. And then the kids all have different daily chores, based on their age/skill level. Some jobs get done every day, but the kids rotate doing them. For instance, our wooden steps get swept every day, so Zoe does it M/W/F and Sonia does it T/Th. And Joshua and Lisey do a similar thing with wiping down the bathroom. T- Use brush & crevice tool in bedroom. Th- Clean inside and outside of slider. In addition to this, they also fold and put away their own laundry, but I didn’t feel it was necessary to put that on a list because they just do this job whenever they have piles of laundry in the living room. And they also bring their laundry down to the laundry room, but they’re pretty good about remembering that on their own. Ok, that’s probably more than you wanted to know about our chore lists. But before I got, here’s an obligatory disclaimer: Please know that I’m not saying that everyone’s family should operate this way and do these same chores…everyone is different, and more or fewer chores may be the right choice for your family. I’m just sharing because I was asked. I do think it’s important for kids to do chores and learn how to do things around the house (because ideally speaking, they’re going to be moving out one day! ), but that can look really different from family to family. « I’ve got an America’s Test Kitchen cookbook for you! 1. What are the consequences if they don’t finish everything on the list before free time. And how do you keep track whether they have done everything? 2. What is that bee-you-tee-ful font that you used and where did you get it? Well, we have a rule that they have to come see me before they go play or go use their screen time, so when they do that, I run through the list with them to make sure it’s all done. If they do something like run off and use their screen time without checking with me and without doing their chores, then they lose their screen time for the next day. We haven’t had to do that much, though…they’re pretty good about checking in. I used a combination of fonts…I gave the girls a choice in the matter, so we scrolled through a bunch to find what they liked. If you tell me which one you liked, I’ll go find out what it’s called. Thanks for the compliment! I really prefer working with words AND pictures (which is why scrapbooking appeals to me, I think), but it was fun to put these together…to make something utilitarian sort of beautiful as well. 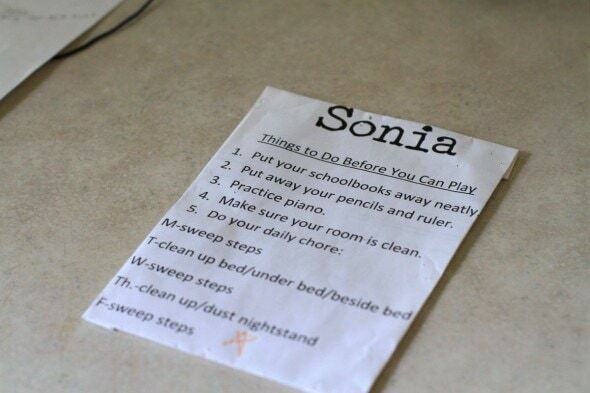 I should make one of these lists for myself, so I don’t let the house get too dirty. also has chores. Don’t want people to think only the girls do housework since theirs are the only ones mentioned (except the meal chores)! Ack! He does, and I was going to mention that, but I forgot. Off to edit. I think this is great. I always had chores growing up and plan to do the same with my kids. I was talking with some coworkers the other day and they were saying how 5 year olds were too young to have chores. When I said that I was helping my mom fold laundry, dusting, and making my bed by 5 they all looked at me like I was crazy. I guess this is why they all need maids to keep their houses clean and mine stays pretty clean most of the time? Here’s the thing–younger kids WANT to help. Sometimes it’s a pain, but as parents it’s wise to develop a positive attitude toward work, and it’s always easier to teach them sooner rather than later. If you wait till they are “old enough” you end up with kids who are much more resistant to helping because it’s all new to them and they resent having less free time. This is great! Do the kids have chores they can do to earn money? Occasionally…for instance, we offered Joshua the job of mowing, weedwacking, and leafblowing, and he does get paid for that. That’s a chore that’s really above and beyond regular household chores and it does take a lot of time, so to us, it seemed like a good paid sort of chore. I am a big fan of the morning checklist. I started doing it when my son was in kindergarten and it took the onus from me to be constantly nagging “have you done blah blah blah yet?” and placed it on him to be responsible. I would ask if he had completed everything on his list and he would run to check it. The bonus part of this was having my younger daughter ask for a morning checklist when she was in preschool–she wanted to be “big” like her brother! 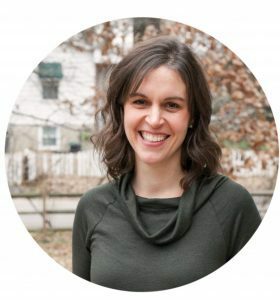 Getting ready in the mornings has never been a high-stress event in our household (yes, we are human and sometimes have bad days, but it’s more the exception than the rule). Having said that, I’m not super-checklisty about other chores–thank you for saying that job assignments look different in every family–it’s true! There are many ways to elicit responsible behavior. This is great. I really need to do the meal chores thing. I usually end up just calling them over to help with setting the table, but they really could be doing more. We currently have Saturday as our chore day, but I’ve been thinking I need to make some changes because our kids now dread Saturday. That’s so sad to me! Maybe spreading it out would be better! So does this mean your kids don’t have any daily chores on Saturday? Yeah, we don’t really do chores on Saturdays, and I like it that way. : ) We do still do mealtime chores, though, because we obviously still eat on weekends! I loved how you framed them! We laminated ours (which I sort of regret because after I did it I noticed a spelling error but am too cheap to reprint it and laminate another) however it really bugs me every time I look at them. 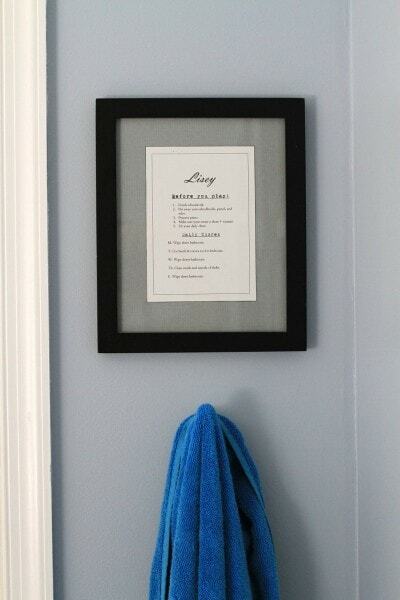 I’m not sure the reaction I had when I saw the images of the new framed chore lists is rational… pure rapture! So by next Monday guess who will also have them in their household? I love making mundane fun and lovely and interesting and this ticks all the boxes. Fortunately I have a trip to ikea planned for tomorrow – so I’ll grab some frames. Kristen – sincerely – you’ve made my day! And frames are recyclable as you insert a new list each time…does it get any better? Wow. This was inspiring. Even made me feel a little giddy. Thank you so much for sharing this! Thanks for sharing. It is always really interesting to see how other families do things, especially concidering my brother and I never had chores growing up. We are responsible, hard working adults today, so I’m not knocking it, but our house was always a mess. 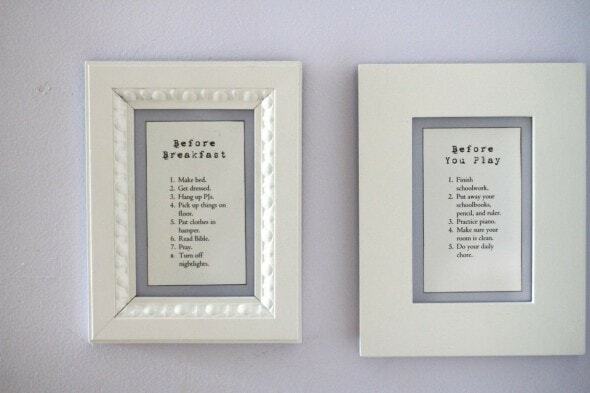 I love the idea of framing the lists. It makes for interesting typographical art and serves a purpose as well. I can’t wait until my kids can have regular chores! I love this however I have an internal dilemma and would love some input. I am a divorced mom whose kids spend 50% of the time at their dad’s house (2 nights/week and every other weekend for the most part). I feel guilty making my kids do any chores because I feel that the limited time I am with them should be quality time not spent cleaning the house. We do work on their bedrooms together once/month but the guilt is overwhelming sometimes. They do have the regular “chore” of getting dressed, hair, teeth, make sure backpack and lunchboxes are either ready to go or hung up at night but not much more than that. I am sure others are going through the same thing as me. How do you handle this? That WOULD be hard! For what it’s worth, my kids typically don’t do chores that take them a long time. Making a bed? 5 minutes. Vacuuming a room? 10 minutes. Feeding the cat? 2 minutes. Taking up their plates after dinner? 30 seconds. That doesn’t mean they don’t procrastinate and make the job longer than it should be–but I think that you can use that as great learning tool. Maybe set a timer to see how quickly they can get a job (properly!) done. Or use a motivating phrase–“Let’s take the next half hour and clean xyz and then we can head out on a picnic!” I don’t think chores need to be an all-day event–a few minutes here, a few minutes there, and they will learn responsibility and new skills without it taking up all your free time. The other thing that may be helpful to do is to have them help with “fun” chores–baking cookies, tending to a garden plant, making pancakes. You can do these things with them and make it fun AND they learn a useful skill. In re-reading this, my thought is that you might want to start small if you haven’t been requiring regular chores from your kids. Have them make their beds daily and after a month or two, add on something else. You don’t need a mutiny! Every time you feel that guilt, remind yourself of this: The primary purpose of a parent is to convert a child into a responsible adult. Teaching a child how to clean, do laundry, cook, etc., is a huge part of that! “Quality time” with a child is just time in which you provide that child your undivided attention, not distracted by a phone, the TV, or another adult friend. Some of my best memories of “quality time” with my parents (both of whom worked jobs that had us in before/after school care when we were younger) were doing things like cooking dinner together, grocery shopping together (Mom took the time to teach me how to read/write cursive so I could read her lists), etc. As I got older, quality time meant going out for coffee or a walk together. Quality time with my dad frequently involved learning how to perform maintenance on a car or fix my bike, go for a bike ride, build something with wood, or fix something around the house. We already do some of these things so it made me feel a little better. My kids have told me that I do a better job parenting than my ex does because I teach them responsibility and rules but it is still a horrible internal struggle. It is different maintaing a house with just one adult doing all of the cleaning. I’m working on trying to find that “happy medium” and appreciate the guidance. This is a great place to find great people. See? They LIKE responsibility! None of us does a perfect job with parenting–I see posts like this and I start thinking, oh, I’m slacking with my kids, they need to work harder! But I think as long as we all require responsible behavior and increase the complexity of what they can do as they get older (I tend to forget about that), we are all on the right path. WOW! 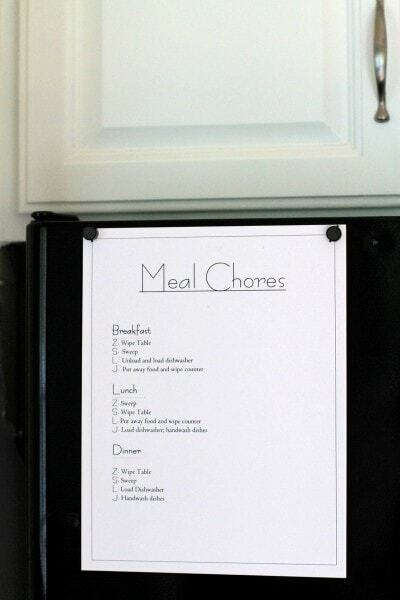 I�m amazed over how beautiful and decorative a chore list can be! When I someday become a mom, I will definitely use this approach! HA!HA! I received a laminator as a Christmas gift one year and for about a year nothing was safe from it. I still love it but have more control over myself. I knew it had become an illness when I tore apart the binding on a cookbook and laminated every page so I could make it into a notebook. How can you not love a machine that makes the most insignificant thing look important!? At what age did you start expecting your children to do chores and how did you go about introducing those responsibilities? Small responsibilities started when they were toddlers/preschoolers…things like hanging up pjs, throwing dirty clothes into the hamper, clearing dishes, and so on. Other jobs, such as sweeping, folding laundry or unloading the dishwasher have gradually been added. Starting when they’re very small makes this easier, I think…that way they are ALWAYS used to having some responsibilities, and it’s not an enormous shock when you have them start sweeping the floor after meals. I’m future mother and I agree to the fact that kids grow up so fast and should be prepared for real adult life and you know making such chore lists is nice way to do that. Even if we want them to stay small a little bit longer, we can’t stop this process of growing up, learning different things, and getting experience. But I have 1 question. How old are your kids? Mine are currently (almost) 14, 12, 9, and 7. The other nice thing about them is you can use dry erase markers to check things off the list if need be. My daughter has a weekly “ticket”–all the boxes have to be checked before she can have any weekend screen time. At the end of the week, I just wipe off the page protector, ready to begin again. Kristen, is there a reason you changed the dinner meal chores to “hand wash dishes?” I couldn’t find the post but I thought you wrote about using the dish washer vs. hand washing before. Is there a frugal reason behind this? I have a dish washer but I hardly use it. Oh, that’s referring to the dishes that won’t fit in the dishwasher (either because the dishwasher is too full or because the dish is too big, like in the case of a cookie sheet.) So, we load as much as possible into the dishwasher, and then the rest have to be hand-washed. Kudos to everyone who patiently instructs children in the fine art of keeping house and feeding the family! And yes, they do eventually move out (sometimes with a little help). Joshua’s faithfully been using My Job Chart for the last several years, and it’s been a lifesaver for him. The girls are not so much into the computer, though, so they’ve preferred to have paper lists. And this year, Joshua decided to make a paper list too…he designed it himself and included one of his doodle characters by scanning it. LOVE this! You’ve really inspired me to tackle updating the chore list for our 10 year old twin boys. Also, an alternative to laminating would be to insert your chart into a page protector. We homeschool and have plenty on hand to store the boys’ work in a 3-ring binder. That way it would keep the gunk off the chart and make it last a bit longer. Just a suggestion:) Thank you for all you do! Do you have any recommendations for devotionals (children and adult)? “Read your Bible” could be interpreted very broadly; I’m wondering how you focus their – and your own – attention. We’ve kept it super simple for our kids and ourselves…basically, we just read straight through the Bible, a chapter or two or three at a time, depending on whether you’re talking about Joshua or Zoe! And then for prayer, we’ve left that pretty free-form as well, though I’ve been thinking lately that I’d like to help the kids make some prayer lists to use daily. Love the way to displayed the chore lists, I laminated my daughters since she’s 4 and has a huge tendency to write on anything she can get her hands on. I like your chore lists. Do you have to remind your kids? or do they just do it on their own? My son cleans up the kitchen (puts dishes in the dishwasher, wipes the table, puts food in the frig) almost everyday. He needs to be reminded to take out the garbage, sweep the floors and clean his own bathroom. I’m not asking too much for a 12 year old, am I? Yes and no…some of them remember to do their chores on their own and others need reminding. I think the chores for your son sound good, especially since I doubt he has to take out the trash and clean his bathroom every day. But you are more likely the better judge of that than I am, since you know your son and you know his schedule. I just chanced upon your website while looking up how to paint furniture. I must say, I LOVE your approach of living a frugal life, while also keeping your home looking beautiful. 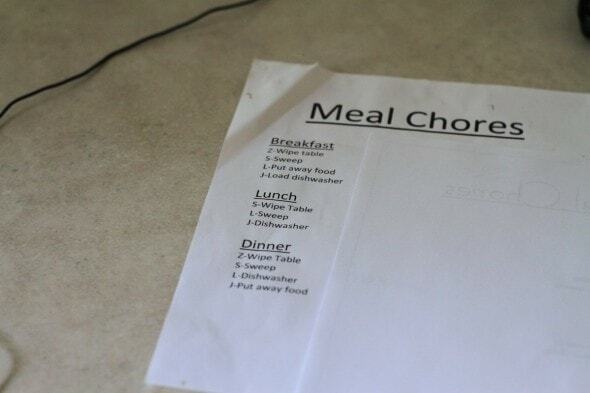 I also love your ideas for making the list of chores for kids. With two kids (boy-10 and girl-7), I do struggle with how to get them to do their chores regularly. I would like to keep checking your updates. Please keep writing! Sorry I missed a question! I try to respond to comments but sometimes one slips through the cracks! We don’t actually tie our chores directly to allowance (Here’s an article I wrote about how we do allowance: https://www.mint.com/vip-content/how-we-handle-allowance-at-chez-frugal-girl/). The lists in this particular post were for when my kids were 14, 12, 9, and 7 (Joshua, Lisey, Sonia, and Zoe, respectively). I love the frames. I have a 9, a 6 year old girls and a 4 year old boy. I am not even sure where to begin. I constantly nag them to fix their bed and clean the room and etc… however I haven’t been successful so far. What is your advise? Well, in our house, screen time and playing with friends time is off-limits until the chores are done. Work first, then play. So if they ask to use their screen time or ask to go out and play, I ask, “Have you done your chores yet?” If the answer is no, then it’s a no to screen time/friend time until the chores are done.